Rethinking Faith and Church: Whose Child Are You? Recently one of my brothers shared with me a situation that resulted in some introspection on his part. I am not going to get into all the details here, except to say that he was concerned with how to respond to a rather unpleasant situation. As a result he asked himself, "Whose Child Are You?" The answer was obvious; he's a child of the King. No question about it! As a child of the King, then, he saw that his response to the unpleasant situation was probably best mirrored to how the King would have responded. How would Jesus have responded? Introspection is a wonderful, and sometimes, painful thing. I suspect that in this instance, for him it was both as well. How do we respond when the going gets tough? Fight back like the world usually does? For many of us, myself included, that would be easy. Or do we take the high road, and strive for the same attitude as that of King Jesus? As "heirs of God and co-heirs with Christ" (Romans 8:17), that would seem to suggest that we have some pretty big shoes to fill. So without further adieu, please join me in welcoming my little brother, Waldo Rochow, as a guest blogger to Rethinking Faith and Church. Thanks for sharing, bro. I never fail (to do the above). That’s quite the list! Before standing up and saying “I do all that”, or even “I do most of that”. Let’s look at the implications. Do I ever sigh when the line-up at the bank or grocery store is long and the clerk is visiting with someone at the front of the line? How about when the traffic light turns green and the driver in front of me doesn’t notice right away? Have I ever joked about someone’s weight, hair colour, ethnic group, or regional ancestry? Do I truly celebrate with the colleague who is promoted ahead of me? Am I really thrilled to hear what a wonderful time someone had on his or her Caribbean vacation? Am I really praising God when I “share” about my new car, house, stereo, or TV or whatever? Is my success at work because of my skills and abilities? … Only my skills and abilities? Do I laugh when someone trips and falls? Do I point out when someone’s wardrobe needs renewing? Do I let the other guy win in negotiations? Have I ever haggled the price for something down to the lowest rate I could get? Do I stay calm when a distracted driver cuts me off on the highway? How about when people push and shove while in a line-up? 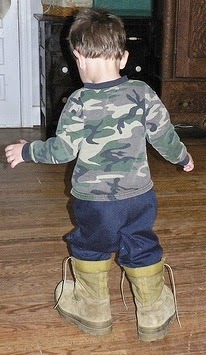 How about when the kids (or spouse) walk through the house with muddy boots? Have I ever watched a thriller movie involving the occult, or zombies, or gang violence? Did I enjoy it? Have I ever watched an abusive situation and done nothing about it? Have I ever doubted someone at his or her word? Have I ever changed my plans because the “odds were against me”? Have I ever given up? These fifteen aspects of Love are really fifteen ways to show the world whose children we are. Next time you find yourself in one of the situations above, I pray that you have the strength to show those around you true love. Thank God we do not have to be perfect to receive salvation!